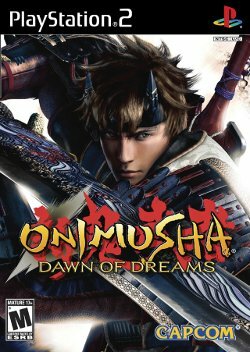 Onimusha: Dawn of Dreams, released in Japan as Shin Onimusha Dawn of Dreams (新 鬼武者 DAWN OF DREAMS, Shin Onimusha Dawn of Dreams? ), is the fourth installment in the Onimusha series released exclusively for the PlayStation 2 in March 2006. Dawn of Dreams focuses on a new protagonist, Soki (灰燼の蒼鬼 a.k.a. Yuki Hideyasu), the second son of Tokugawa Ieyasu. Like Onimusha 3: Demon Siege, Dawn of Dreams utilizes a complete 3D rendition of its environment rather than pre-rendered backdrops. However, the player is now able to control the camera for most of the game, as opposed to the static camera angles employed within its predecessors. A shop system allows the player to purchase weapons that they can also upgrade along with valuable supplies such as medicine and accessories that convey a variety of benefits. Finally, a second party member now accompanies the player which they can also switch to and control. During gameplay, the second character that is not under the control of the player can be issued commands via the directional buttons (for tactics) with the AI performing them to the best of its abilities. Dawn of Dreams is also the second canonical game in the series to allow the players to hear either English and Japanese voice-overs, a feature that was omitted in both the second and third games. The game takes place in 1597, some fifteen years after the defeat of Oda Nobunaga at the end of Onimusha 3: Demon Siege. Nobunaga's vassal, Toyotomi Hideyoshi, takes control of the country, unifying it under one banner and essentially ending the wars that had torn the land apart under his former lord's banner. However, this period of peace ends with several natural disasters acting as an omen of things to come including the appearance of an "Omen Star" in the sky. The Genma return to Japan due to all of the natural disasters and prey on the innocent. Hideyoshi ignores all of the chaos sweeping the land. In addition, Hideyoshi sends massive armies of men and Genma to invade the Asian continent over seas. Two years Hideyoshi uses the Genma armies to gather "cherry trees" across Japan. This page was last edited on 11 May 2016, at 22:41.